A Bristol Blenheim Mark IV of the Royal Air Force's Number 2 group pulls away after a successful attack on the Fortuna Power Station in Quadrath. You can see the end of the dorsal turret Vickers .303 machine gun lower right. Two power stations, Fortuna I and II, burning lignite (brown coal), were run by Rheinische Aktiengesellschaft für Braunkohlenbergbau und Brikettfabrikation or RAG (Rhine Public Company for Brown Coal and Briquette Manufacturing) in the small village of Quadrath. Another target was the Goldenberg-Werk Power Station in nearby Knapsack. Fifty-four Blenheims were detailed for a low-level raid, coming in over the Netherlands to attack, causing significant damage. The Blenheims came from 18, 21, 82, 107, 114, 139 and 226 Squadrons, commanded by Wing Commander Nichol in his first Blenheim mission (??? ?-1941) and navigated by Officer (later Wing Commander) Thomas Baker (1914-2006) who later said the mission was "almost suicidal - it was the only time in my life that I saw my fellow aircrew grey and shaking." 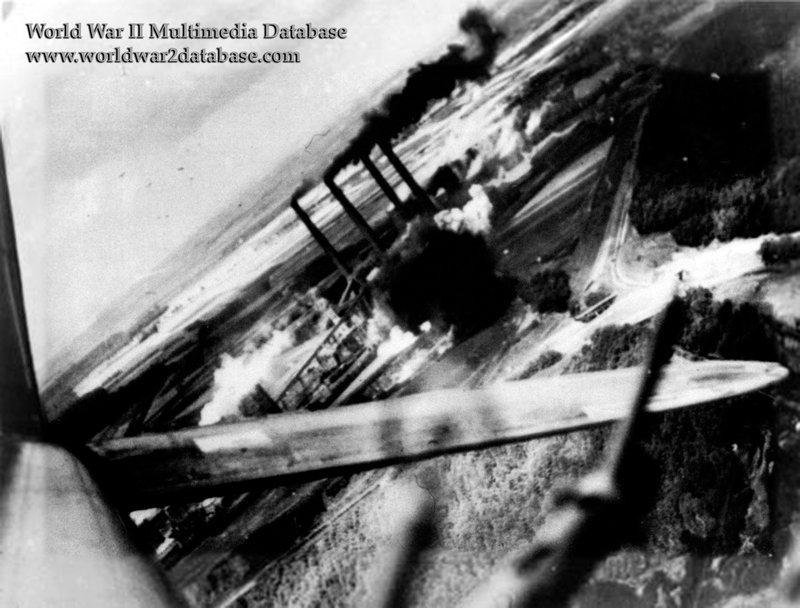 Ten of the Blenheims were shot down and others were damaged, mostly to the large anti-aircraft concentrations around the plants. The power stations were heavily damaged. While the bomb run on the plant had no fighter cover, Supermarine Spitfires of 306 and 315 Squadrons covered the incoming flight, 308 Squadron with Spitfire VBs and 263 Squadron with Westland Whirlwinds flew top cover, and three other squadrons flew cover for the fighters. 485, 610 and 452 Squadrons, all flying Spitfires, and three other squadrons of Sprtfire VBs struck airfields and targets along the French and Dutch coasts. Lacking the range to get within 100 miles of Cologne, the Blenheims went in on their own; all the Spitfires had to withdraw after five minutes of loitering in the formation area over Holland. 19, 65 and 226 Squadrons, flying the standard short-range Spitfire II, and 66, 152, and 234 Squadrons, all flying the longer-ranged standard Spitfire IIA, rendezvoused with the surviving Blenheims and escorted them back to England. Four Spitfires were lost. While the Fortuna plants were soon back online, the daylight raid was intended to pull German fighters from the Eastern Front, and soon the Luftwaffe began concentrating their strength against the RAF, and later, the United States Army Air Force's VIII Bomber Command.